Choosing the right bearing is easy, once you know how. To help, this article outlines the steps to take. It includes guidelines for bearing selection and curves for estimating power loss and oil flow requirements. Directed-lubrication Bearing, LEG® By Kingsbury, Inc.
A slim-equalized thrust bearing, primarily used in high speed machinery that have limited free axial space, such as overhung compressors. The following guidelines for assigning load capacities to tilt-pad fluid film thrust bearings take into consideration theoretical analyses, field experience, and actual test results. Published bearing ratings should have a safety factor of at least two. For low-speed operation the minimum film thickness should be at least two times the thickness required for operation with clean, cool oil and fine machine surface finishes. However, the bearing manufacturer does not have control over the surface finishes of the thrust collar or the cleanliness of the oil; therefore, it is only prudent that a safety factor of two be built into the film thickness and load ratings. 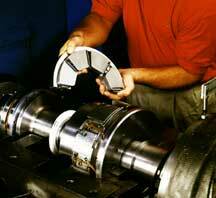 Check with your bearing manufacturer to confirm their built-in safety factors. The mechanical limit of the bearing is not normally a factor when using typical thrust bearings. The structural design limit of most thrust bearings is five to six times that of the rated load value. Thus, the bearing can handle instantaneous surge loadings, caused either by process surges or seismic tremors which can often occur. The bearing can absorb these momentary surges without difficulty even in the oil films. Of course the bearing cannot operate continuously under these surge loadings. Talk to Kingsbury staff? Click here. White metal temperature limits the load-carrying capability of thrust bearings for high speed operation. Usually, the practical limit of 130ºC is a maximum temperature for most load ratings, measured at the 75/75 location on the thrust shoe white metal face. Many tests have been conducted at operating speeds greater than 25 meters per second using various thrust bearings. Therefore,the white metal will not start to become plastic or creep until temperatures reach 160ºC. The unit load would have to more than double for the temperature to increase from 130ºC to 160ºC. A safety factor of two will assure safe operation. Safety factors of two in all modes of operation comply with many end-user specifications, such as the American Petroleum Institute. In some applications, however, specifications restrict white metal temperatures to less than 115ºC. In others, the original equipment manufacturer needs a bearing that will fit in existing space but carry even greater loads than recommended by most manufacturers. For these special applications, there are some very viable alternatives which we will discuss here. Special chrome-copper-backed thrust shoes can be used in place of standard thrust shoes to reduce white metal temperatures. The chrome-copper backing material has extremely high thermal conductivity that absorbs the heat from the white metal face, thus reducing maximum white metal face temperatures. 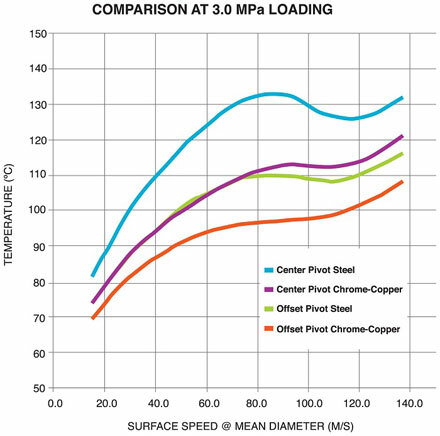 At high loads and moderate to high speeds, chrome-copper-backed thrust shoes can easily reduce temperatures by as much as 8 to 12ºC compared to standard steel-backed thrust shoes. Chrome-copper-backed thrust shoes are recommended to reduce white metal temperatures; however, they can also be used to obtain increased load carrying capability, normally on the order of twenty percent. Chrome-copper-backed shoes must be applied with caution, though, because they are not nearly as effective at lower operating speeds and in light load applications. Furthermore, at low operating speeds, the oil film thickness of chrome-copper-backed shoes is the same as for steel-backed shoes; therefore, they offer no increase in load capacity during low speed operation. Significantly, chrome-copper thrust shoes are physically the same size as standard steel shoes and are completely interchangeable; chrome-copper shoes are used with all standard parts such as base rings and leveling plates. Chrome-copper shoes are center-pivoted, can be used for bidirectional rotation, and can easily replace standard shoes in the field because no bearing modifications are required. Thrust shoes can simply be exchanged. Since the pivoted shoe thrust bearing was invented in 1912, various types of offset pivot thrust shoes have been designed and manufactured. In fact, thrust bearing theory indicates that pivoted shoe thrust shoes will not operate if they are flat and centrally pivoted. That is, they do not have load-carrying capability. This is offset by thermal and elastic crowning to enhance load carrying capability in centrally pivoted shoes. However, it has been generally recognized that a better way to achieve maximum load capability is to offset the pivot for unidirectional applications. In recent years, there have been real breakthroughs in optimizing pivot location and pivoted thrust shoes. The optimized pivot location increases minimum oil film thickness dramatically. It also achieves almost perfect crowning, thus utilizing the entire surface area of the thrust shoe to carry a load. As a result, shoe temperatures at the same unit loadings as the standard bearings are reduced dramatically. At high load and high speed operation, there can often be more than 15ºC reduction in temperature between the standard pivoted thrust shoe and the optimized offset pivot thrust shoe. Ultimately, the optimized offset pivot thrust shoe can carry up to 50 percent greater load than the standard center pivot shoe and still yield operating temperatures that are less than those of a center pivot steel shoe. It should be noted that the optimized offset pivot thrust shoe is effective at all operating speeds, because the minimum oil film thickness is increased over the standard center pivot shoe. The offset pivot thrust shoe, of course, is good only for unidirectional operation. Extreme care must be taken to assure that, when using a double thrust bearing (that is, a bearing on each side of the thrust collar), the offset pivot thrust shoes are installed properly. Catastrophic results can occur if offset pivot shoes are installed with improper rotation direction. This problem is more prone to happen in retrofit applications, since new designs usually incorporate some mechanical safeguards to prevent improper assembly. Retrofit applications of the offset pivot shoes are encouraged since they are usually completely interchangeable with standard shoes. Offset pivot shoes can also be supplied with chrome-copper backing material. Directed lubrication technology can increase the bearing's load carrying capacity, while, at the same time, decrease white metal temperature and oil flow rates. There are a number of directed lubrication bearings on the market, including a leading edge groove (LEG) type as offered by Kingsbury, Inc.
LEG-type thrust bearings with steel-backed shoes offer a temperature advantage of up to 12ºC, depending on load and shaft speed, when compared to standard bearings. LEG bearings can also provide a load-carrying capability increase of 20 percent when using steel-backed shoes and up to 50% using chrome-copper backed shoes. In addition to lower temperatures and increased capacity, the KingCole bearing will operate at oil flow rates as much as 60 percent lower than the standard bearing, yielding a frictional loss reduction of more than 40 percent. All of the special design features or special bearings just mentioned offer certain advantages over standard pivoted shoe thrust bearings; however, these advantages do vary with bearing size, type, operating speeds and loads. If the user requires such a bearing, it should be selected by the manufacturer. For special, critical applications, contact the manufacturer's engineering department for specific recommendations.